← Laughter as brain injury medicine … Are you sleeping? Do you have a written plan to help yourself or your loved one through the difficult days of TBI? One did not like telling others about having a bad day. They are just days in the lives of TBI. Others would refer to these days as “bad days”, but when you have chronic illness, injury, brain dysfunction, or TBI it’s just part of life. Separating these days into another category such as “Red Flag Day”, “Blue Day”, or “Acceptance Day” is frequently easier to accept with optimism. One found it easier to identify without complaining where others simply understood and didn’t question any further about the day. It was a day to be understood without adding further stimuli. Since these days are frequent, others also knew immediately what to do and what to avoid so other triggers would not escalate behaviors or confrontations. 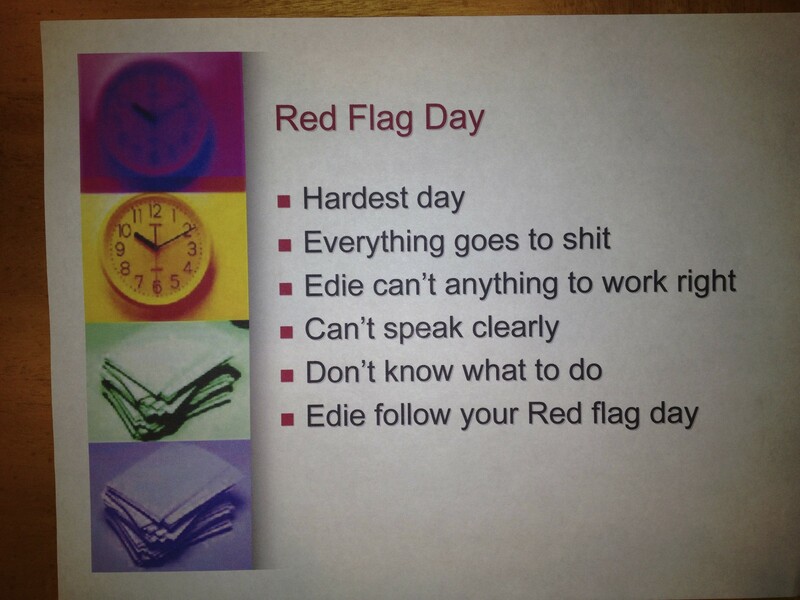 Bad days were referred to as “Red Flag Days”. Bad days wasn’t acceptable, but referring in a different manner was easier. One was fortunate enough to have another nurse prepare plans for a bad day, red flag day, survivor’s red flag day, and spouse’s guide for a red flag day. These posters help remind others what they need to do during these unpredictable and frequent times. They are also reminders to guide the TBI survivor when they can’t think clearly or remember what needs to be done next. Since everything is unpredictable having this in writing makes it quickly accessible (especially when one can’t think or when others forget what they should do to help). Can easily refer when posted on mirrors or at doors. Post them in the place that works best for you. These are extremely helpful to those living in the home. Others just think it’s ridiculous! It’s not at all ridiculous. They are helpful. Anyone who doesn’t understand brain injury won’t get it, but the people these concern the most are those who live in the same household or environment as the survivor and they understand. Don’t be concerned about comments from others. They are too self-centered to help and simply have not taken the time to learn about brain injury. Keep some research articles around the house and hand them out. It’s always an opportunity to educate others. It doesn’t mean they will read them, but it’s the honest attempt at educating that counts! 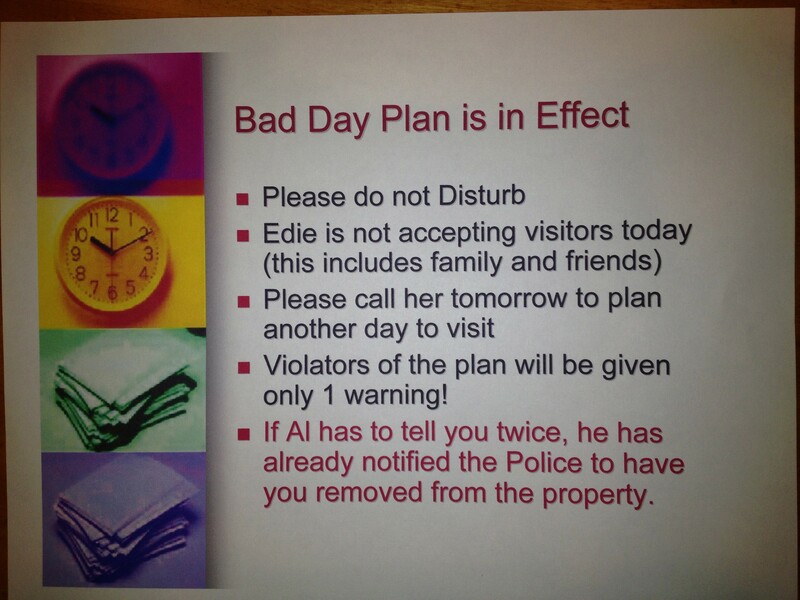 Bad Day Plan in Effect is very simple. Stay your distance and don’t bother the survivor! It appears to be extreme, but there isn’t anything extreme about this plan. It’s the way it is with TBI … Boundaries are essential to health! Written boundaries are helpful, and sticking to the plan helps the survivor deal with all the changes that occur in an unpredictable manner. 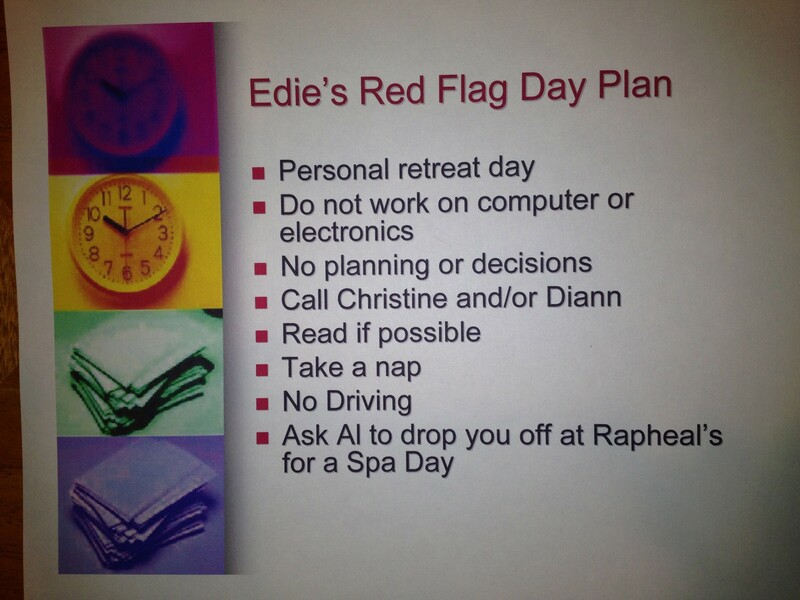 Red Flag Day identifies the symptoms and directs the survivor to follow one’s red flag day plan. When one can’t speak clearly it doesn’t mean they don’t understand, but constantly pushing oneself to do things doesn’t necessarily help. Often those struggling with determination, perseverance, motivation, often put more pressure on themselves than others expect. Who’s expectation is it anyway? Is it you falling short of your daily goals? Is it others expecting you to be who “you were”, instead of who “you are”? 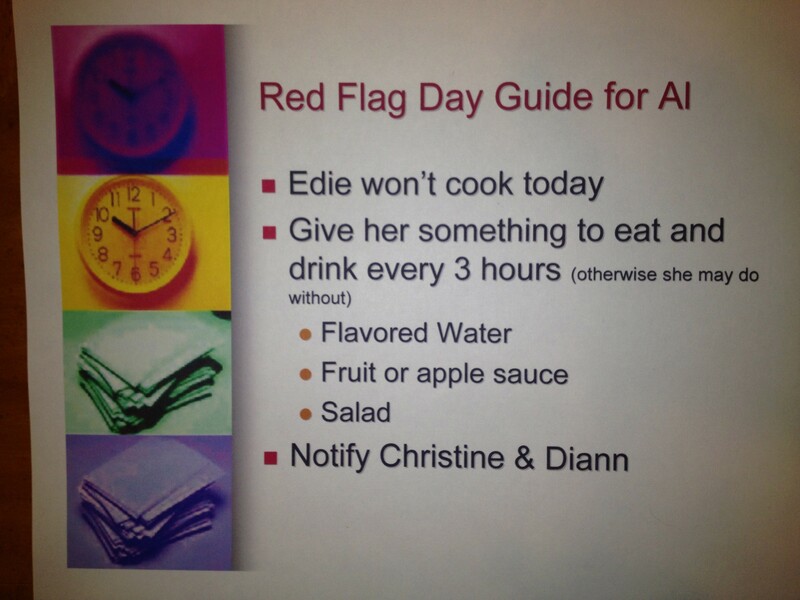 Edie’s Red Day Flag Plan helped guide one to less stimuli and not to keep pushing self. Self=Determination is great, but it doesn’t work with TBI. Determination can lead to disaster! Pushing oneself past the point of thinking clearly and problem solving leads to difficulties in many areas. One had and continues to have problems putting things aside, instead pushing to figure out problems which frequently complicates everything in one’s life. Putting things aside, and picking them up the next day works best! It’s just very hard to do! Red Flag Day Guide for Spouse helps identify the needs of one, since the survivor doesn’t know what is needed and focus has never been on self. One continued to think and help others, but few … even the closest didn’t know how to help. This guide helped with expectations and basic needs leaving them with information to contact others that understood and could help them through these difficult times. It was a time they could get support. This would also let others know something was happening and since “Christine” and “Diann” were both nurses they could easily intervene or identify complications and provide guidance. If you don’t have nurses to call for support, your closet family and true friends will be there. If they leave you they really were not your friends! These posters were made at that time by a dear friend and nurse who understood brain injury after she “got one”! Have you found it easier or do you think this is helpful to list your personal needs and guide yourself and others at times of stress on complicated days? These posters are to be used as guidelines to help you and your loved one create your own based on your personal needs and personality. What have you tried that worked? Though the article is true I think you need to remember that not all brain-injured people have the luxury of being cared for in such a manner…you are a lucky lady! My wife and I call my bad days, “No driving days” or “Not a driving day.” It is not a complaint but just a way to label the activity level for the day. Sometimes, a No driving day will be spent sleeping most of the day. I will try to watch TV or read online and fall asleep with my laptop on my lap. I put my cell phone and the cordless house phone next to me so if it rings, I don’t have to try to get up to answer it. I am usually quite clumsy on these days.